Bringing out the best of readers, bargain hunters and volunteers alike, Bookstock Used Book and Media Sale returns – bigger and better than ever – Sunday through Sunday, April 27 – May 4 at Laurel Park Place in Livonia. Marking 12 years of supporting literacy, Bookstock has generated close to one million dollars in proceeds to benefit reading programs in schools and educational projects throughout Oakland County and Detroit. More than 800 volunteers work together throughout the year to organize and staff the weeklong Bookstock sale. “You’re never too old, too wacky, too wild to pick up a book and read to a child.” 5th and 6th grade volunteers on hand from the Book Brigade for Read, Detroit! at Bagley Elementary School: left to right, Eboni Bryant, Katerina Edwards, Michael White and Carena Miller. “A perennial favorite of our volunteers, Bookstock feeds our Need to Read,” said Rosa Chessler who serves as co-chair along with Susie Sills-Levey in Federation’s year-round Women’s Philanthropy program for “Tikkun Olam Volunteers (TOV).” Volunteer Day at Bookstock is one of four opportunities throughout the year to volunteer in TOV. The other three are Read, Detroit! and two outreach programs to benefit seniors. TOV will be on hand at Bookstock throughout the day, Tuesday, April 29. To join the effort or sign up for a shift, call Tovi Snapstailer at 248-203-1474 or email snapstailer@jfmd.org. 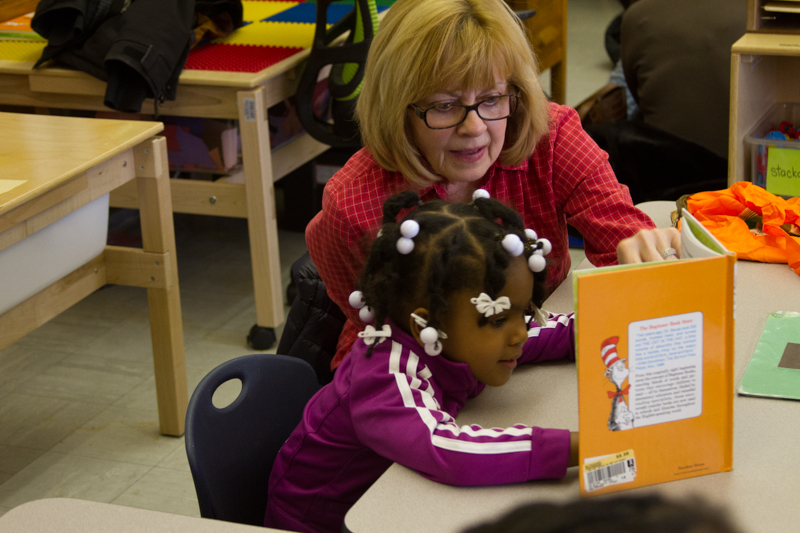 Margo Lazar,TOV Associate Co-Chair with young reader at Bagley Elementary School. They were ready. They were new readers, eager to read and they were everywhere! Readers in classrooms. Readers in the halls. Readers seated in circles at tables and on the floor. Readers, big and small, curled up with books. Reading together. 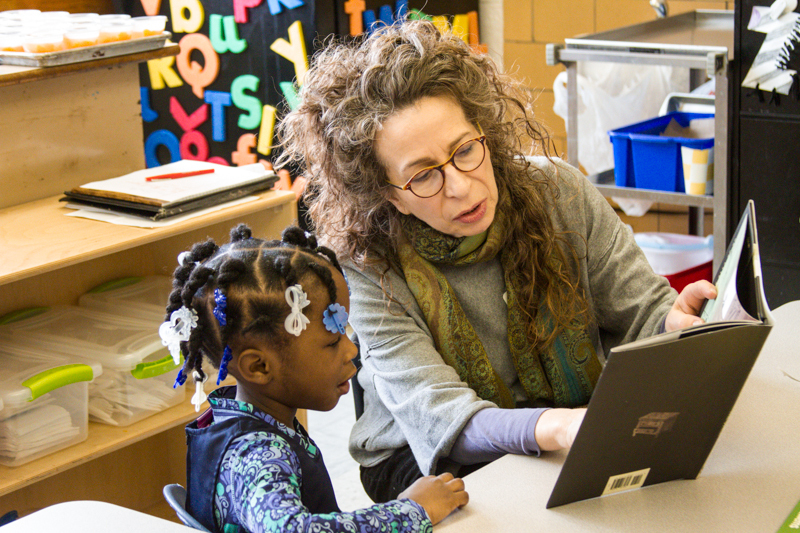 With new books in hand – to read and give to young students celebrating National Reading Month in March – more than 80 Tikkun Olam Volunteers from Federation gathered forces at the Bagley Elementary School in Northwest Detroit. Sarah Hartman-Silow, a Bagley alumna, with a preschooler in Room 108. For some, it was a first-time visit to an old brick school with bright blue doors on Curtis Street. 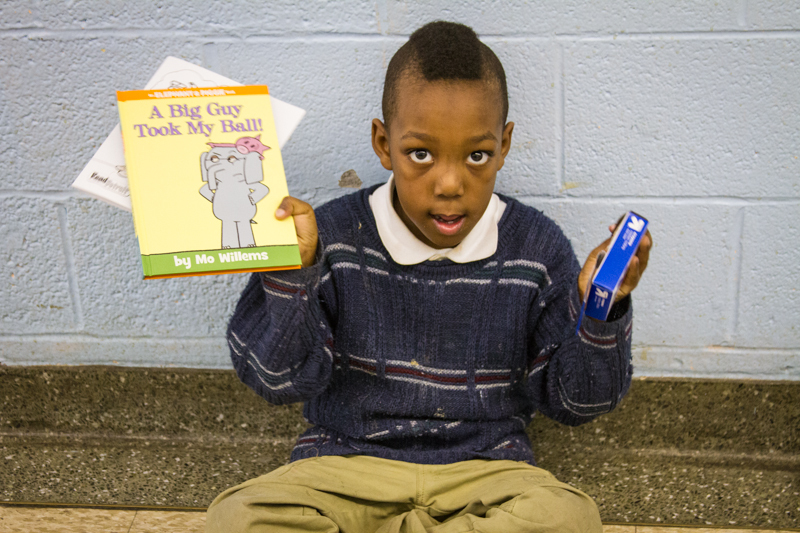 For others, it was a return to the old neighborhood, back the very school where they learned to read. “Just down the street is the Northwest Activities Center which was the Meyers-Curtis JCC where many of us here learned to swim and to play basketball poorly,” quipped Ben Falik, a Federation partner in organizing the event. 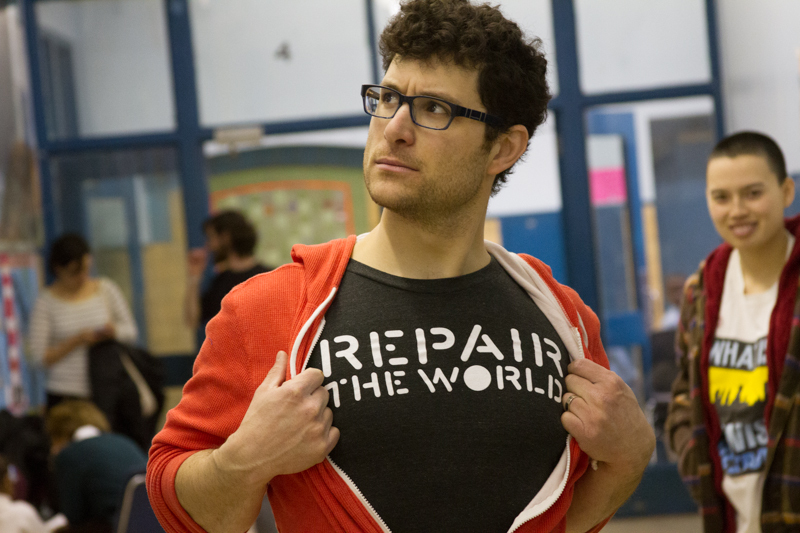 Ben is the Director of Repair the World in Detroit, a national organization working locally to make service a defining part of Jewish life, with partnerships throughout Detroit – including the Bagley Book Brigade, an enrichment program that meets twice a week at the school. Ben Falik, a Read Detroit partner from Repair the World Detroit. 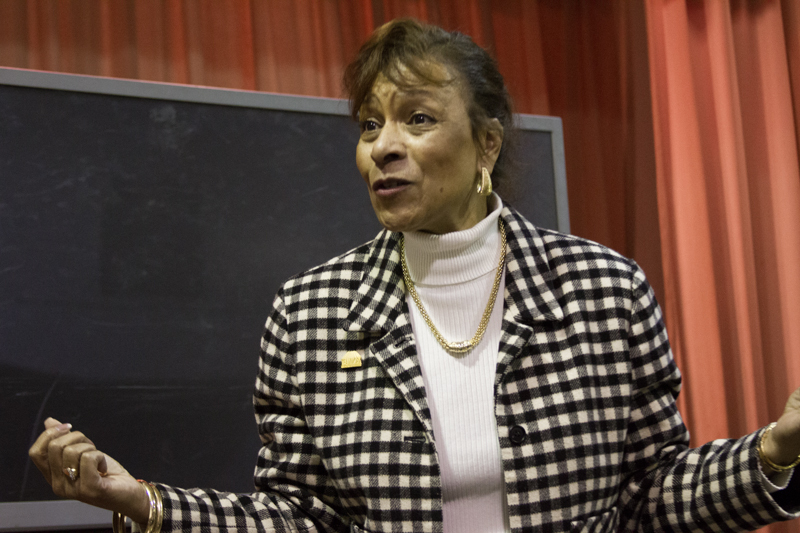 Bagley Principal Cheryl Price encourages volunteerism in numbers. Need a project? Please call 313-494-7175. Bookstock’s Pre-Sale will kick-off on Sunday, April 27, at 8:15 a.m., with a performance by the Larry Callahan and Selected of God Choir, made famous by the Chrysler Superbowl XLV commercial. There is a $20 admission charge for the Pre-Sale only, which runs through 11 a.m. and offers savvy shoppers and collectors first crack at Bookstock’s treasure trove of bargains. Bookstock has over 100,000 donated used books, DVDs, CDs, books on tape, magazines and records for sale at bargain basement prices. The sale will continue through Sunday, May 4, running Sundays, 11 a.m. – 6 p.m., and Monday through Saturday, 10 a.m. – 9 p.m.
Monday Madness – Monday, April 28, one lucky buyer will receive a $500 gift card and 750 shoppers will receive spectacular giveaways. Teacher Appreciation Day – Tuesday, April 29, Bookstock celebrates teachers by giving 50% off to all teachers with a valid ID, (3 to 9 p.m.). At 5 p.m., Bookstock B.E.S.T. 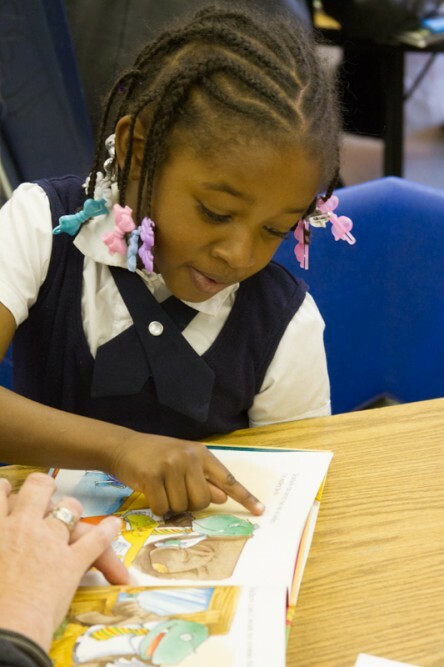 * Awards, (Bookstock Extraordinary Student/School/Teacher) will be presented to fourth grade students from Detroit Public Schools who best describe “My Favorite Book…and Why.” Cash prizes will be given to five students, their teachers and their schools. Bookbuster Special Days – Wednesday, April 30, and Thursday, May 1. Buy 3 books and get the 4thbook *free (*least expensive item), from 3 – 9 p.m. Spend $25 or more and be entered in a special drawing for a prize from the Detroit Lions. Half Price Finale — Sunday, May 4. All remaining books and media will be sold for half price! Working in partnership with Wallside Windows and Gardner–White Furniture, Bookstock established the Bookstock Scholar Awards, given to outstanding students at Wayne State University’s School of Library Science and Information Technology. 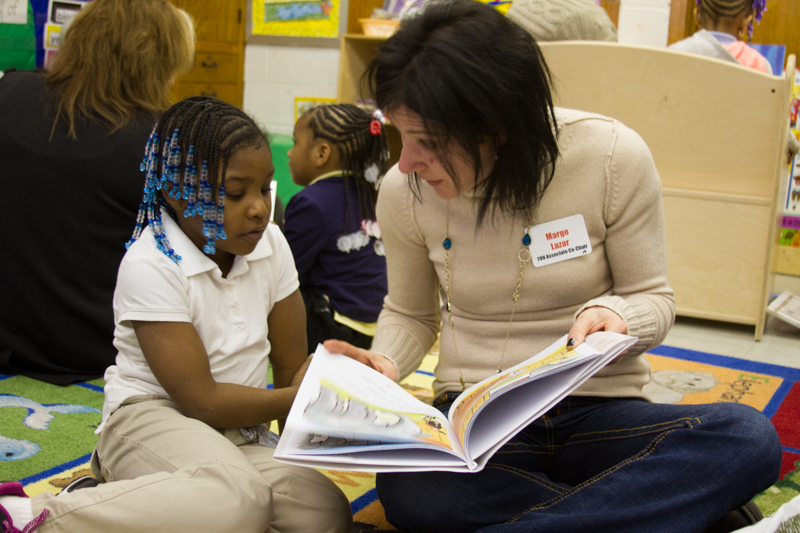 The Bookstock Fund, launched in 2012, provided 19 micro grants to Detroit Public School teachers for education and literacy projects. Detroit News columnist Neal Rubin is Honorary Chair of Bookstock and Carol Goss, immediate past president and CEO of the Skillman Foundation, is the Bookstock 2014 Champion. 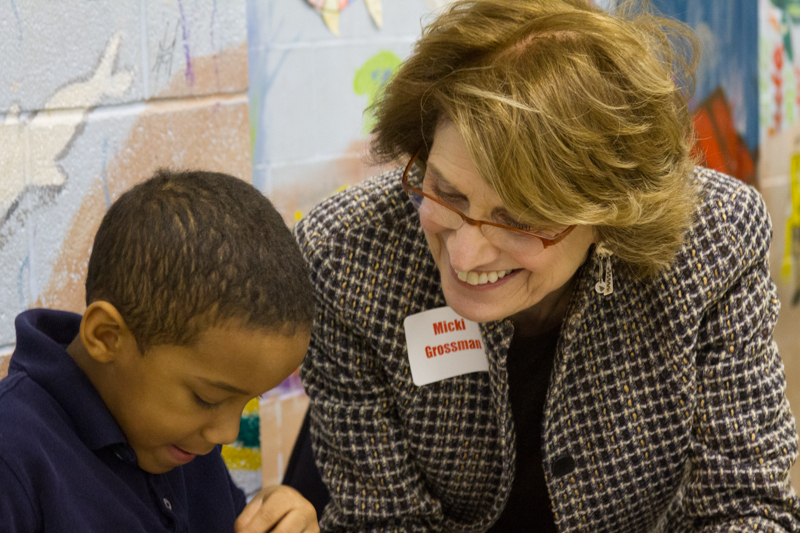 Longtime Bookstock volunteer, Micki Grossman with a young reader at the Bagley School. Bookstock is brought to the community by the Oakland Literacy Council, Detroit Jewish News, Schostak Brothers and Company, the Jewish Community Relations Council and a consortium of Jewish communal non-profit organizations that support education and literacy projects throughout metro Detroit. For more information about Bookstook, call the Bookstock hotline (248) 645-7840, ext. 365 or visit www.bookstock.info.